Sometimes I get really disappointed when I order what sounds like a fantastic meal only to find it blah. My family has our places we love to eat but there are some days that we just pick places and go. For one meal, we stopped at a restaurant that had promise for vegetarian meals. I ordered sun-dried tomato and zucchini risotto. When the plate arrived, my mouth was watering. I could barely contain myself and filled my fork with a big bite. I went to savor this first bite only to realize I couldn’t taste anything over the salt. I wanted to cry. Seriously. I’ve yet to conquer the home sun-dried tomato but trader joe’s has some lovely dry-packed ones that I used for this meal. If you want to use fresh tomatoes, roast a few cups of cherry tomatoes and add in at the end. Also, if you don’t like pungent cheese, you can always use a bit of cream cheese mixed with some parmesan to get that creamy texture. In a sauce pan, heat dry-packed sun dried tomatoes, water, and stock. Reduce to low and let simmer while you continue to cook risotto. Heat tablespoon of olive oil over medium heat. Add shallot and sauté until translucent and fragrant, about 3 minutes. Stir in sweet corn and continue to cook until lightly browning, 4-5 minutes. Keeping heat over medium, add wine and let cook until almost evaporated. Add farro and 1/2 cup of the stock. Continue to stir until the farro absorbs the stock. Continue to add/absorb 1/2 cup stock until the farro is tender, about 45 minutes. 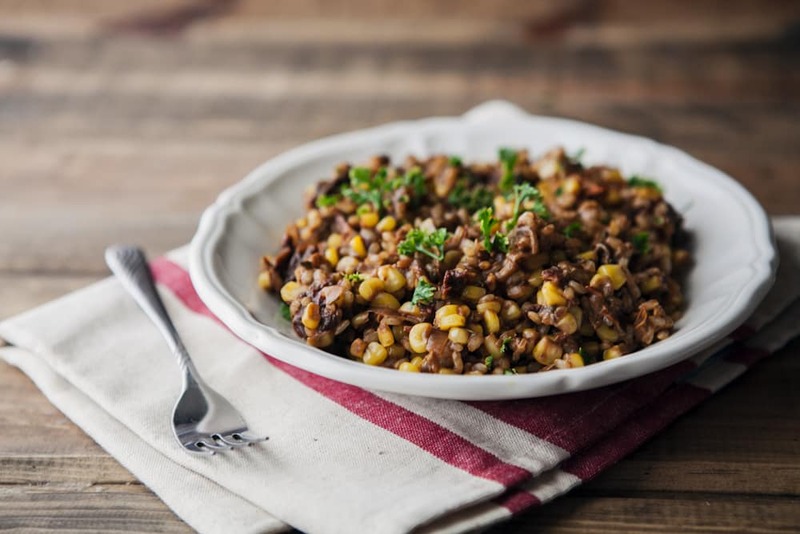 Test farro for tenderness occasionally. 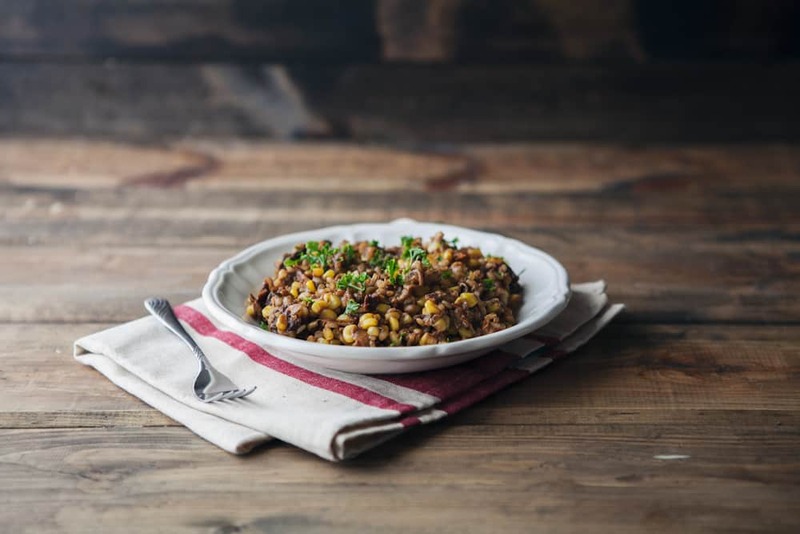 When farro is tender, stir in cooked sun-dried tomatoes, rosemary, and salt. Cook for 1-2 more minutes then remove from heat and add in goat cheese. Serve immediately. There is nothing worse than getting excited for a meal and then finding it a complete disappointment. Life is too short to eat bad food. I love that you took the idea and made something delicious with it! Your pictures are so good in this post, Erin. Perfection. i totally understand that disappointment over something you are expecting to taste so great. my mom always told me to start with a little salt because you can always add more as needed. maybe that restaurant needs to hear my mom’s lecture. I love that you let a bad restaurant meal inspire you to make something wonderful! Looks delicious! 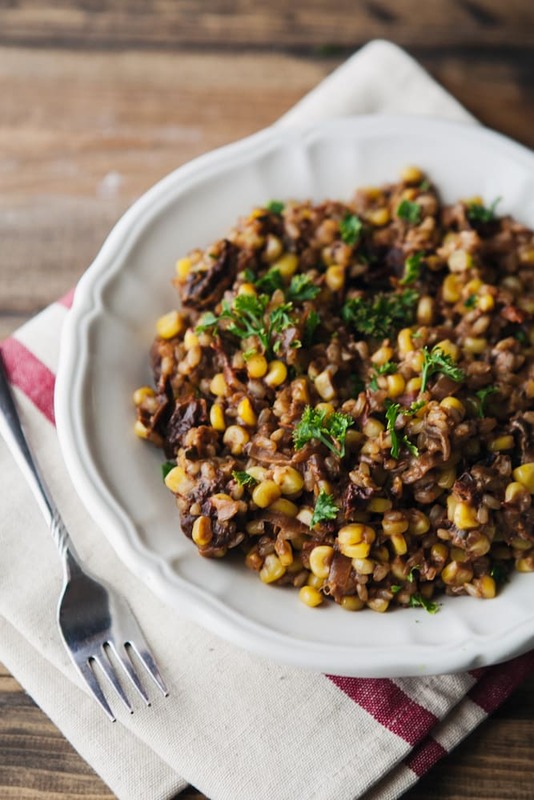 Could you use pearled barley to replace the farro? Your pictures are very lovely in this post, Erin! But then, they always are. 🙂 I hate being disappointed by eating out. It’s always very sad. This looks delicious. Umm… delicious! Looks great, Erin! I love farro risotto, but I always associate it with fall for some reason. I love the idea of adding corn and sun-dried tomatoes to it for summertime–this looks delicious! Mmm this looks awesome! So healthy and filled with a bunch of great flavours. Yum! It looks yummy and don’t you wish sometimes cooks did not rely so much on salt…. I can totally relate on that urge to cry – when I’m disappointed with a meal I do a mean pout. I really can’t wait to try this one. I’ve yet to cook farro well, and I’m kind of a sundried tomato addict. Erin – I love the sound of this combination – summery and satisfying! Glad you came up with a new version sans the salt overload! You are welcome and I bet the Cab was delicious with it- what a perfect meal! Again, Huge sun dried tomato fan! That looks delicious! This is my spring break, so nights that I’m at home cooking, I will be trying your recipes. This one’s first as I have my own dried tomatoes from last summer and frozen corn that I put up last summer. Always have farro here as it’s one of my favorites. What a great concept!!! Can’t wait. Thank you. Fabulous. I forgot the salt, which is ok by me…awesome!!!!! Great recipe. My first experience with farro, and I am pleased! My husband and I talked about adding some peppers to it next time. The goat cheese was WONDERFUL in it and I think that the red wine (as a previous poster said) would be great, too! Just made this. We’re vegan, so we skipped the goat cheese. I added walnuts for a bit of crunch. Delicious! Such a versatile recipe! I used fresh from the garden tomatoes and corn in the summer (and loved the leftovers cold for lunch! ), and switched it over to eggplant, quick-pickled raisins, and almonds for fall – gave it a caponata feel.